It's Thursday and kind of an odd day for me. I'm off of work tomorrow (hence no column), so this is the end of my work week. But since I was out sick on Monday, it turned into a 3-day week for me so even though it's the end, it feels like the middle. Add that to the various medications I'm taking, and I barely know my own name at this point. But I'll try and bring you a solid column anyway! Before I get to the rest of the docket, we here at the Sports Take would like to offer our congratulations to the Philadelphia Phillies on dispatching the Dodgers and getting to their first World Series in 15 years. More on baseball on Monday. 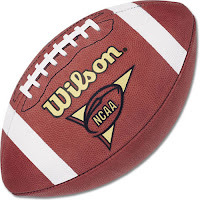 Today I've got the 4th edition of the Sports Take Top 10 College Football Poll. Then I'll bring you more of the finest in college football prognostication - well I'll bring you my Week 8 picks and you can decide the quality of them! And finally it's this week's version of the DFTU. So let's get to it! You can always count on Sir Winston for a solid quote. I don't know when the last biography was written on him, but I'm hoping Walter Isaacson (author of the recent Einstein, Franklin and Kissinger biographies) picks him as his next subject. Fascinating stuff. The Horns beat #1 ranked Oklahoma in a great game. Their reward is back-to-back-to-back games versus offensive powerhouses Missouri, Oklahoma State and Texas Tech. Have fun with that. Bet they're glad they didn't play this week! Dominated a lousy-looking Wisconsin team on the road. Any question as to who's the best team in the Big 10 should be settled in two weeks when PSU visits Ohio State. The Sooners now need Texas to lose twice to conference foes to have any chance to play for the title. Made a statement versus LSU that the Gators belong in the Nation Title conversation. Their November 1st contest versus Georgia will decide the SEC East. Nebraska loses 52-17 at home to Missouri and Tech needs overtime at home to beat the Huskers. Tech isn't even close to the 5th best time and will lose 3 regular season games this season. Until that happens, I guess the Red Raiders belong here. This year's Boise State? Or is Boise State this year's Boise State? Shut out a pitiful ASU team 28-0. I'm still not sure there's a big enough win left on their schedule to move them into BCS Title contention, but if everybody above them keeps losing, who knows?! Solid, though unspectacular win at home versus Tennessee. Still not a team I expect to see at the top of the Polls this year. Just for the record, even though Ball State is the current official Sports Take bandwagon team, I wasn't the one that voted for them. Though I love the fact that somebody did! So what do you think? Anything in there seem criminal to you? Post a comment below and let us know! Let's see. Clemson fired their coach, benched their quarterback and I think their running back is now dinged up too. And Tech's only giving 2 points? Yes please! Yes, the game is at Clemson, but as poorly as this club's been playing, I think they might prefer to play on the road as often as possible. At least you expect fans to be hostile on the road. The line's been sliding towards Tech all week, so let's get on the bandwagon while we can, give the 2 points and root, root, root for the triple-option! Okay, I've resisted picking Wisconsin games all year because I didn't want to have to root against the Badgers and I've never trusted them to cover. But after 3-straight losses to open the Big 10, I feel like I need to change the mojo somehow. So I'm picking them to cover. This game is vital to their chances. The Badgers still need 3 wins to be bowl eligible. And while they have on in their pocket against Cal Poly late in the year, they still need to get on a roll to avoid the indignity of the Motor City Bowl. Iowa's coming off of a big win over Indiana, so they're feeling some confidence. But that confidence is tempered by the fact that people are still calling for their coach's head. Combine those two factors and the stage is set for an upset at Kinnick Stadium. Yes, the Badgers are a road dog, but allowing for crazy picks is why I invented the Flier Pick in the first place! So we're taking the 3.5 and praying that Wisconsin can get off the schneid! I'm loathe to pick the team that just laid the wood to my beloved Badgers, but this one has 45-7 written all over it as well. After their emotional win over the Badgers, the Wolverines have lost two straight including a 13-10 gut-punch from Toledo last week. The team's just a mess. They don't have the tools to run head coach Rich Rodruigez's offense the way he wants, and he steadfastly refuses to change his scheme to fit his talent. The result is inconsistently on a level seldom seen in Ann Arbor. But this game isn't even in Ann Arbor, it's in Happy Valley. And that makes a Nitanny Lion rout even more likely. There's a slight chance that the Lions look past this game to their showdown next week with Ohio State. But Joe Paterno's been around way too long for that to be much of a risk. No, I think that Penn State rolls in this game and that giving 23 won't be any kind of problem. I know the Tigers just got worked by Florida last week, but they only give 3 against a mediocre South Carolina team? I see coach Les Miles throwing the 4th string kicker in a closet somewhere and swearing to the rest of the team that he'll only feed the kid bread and water until they start playing to the level he expects. In any case, the Tigers will be fired up this week and run one up on South Carolina to try and get some of their credibility back. We'll give the 3 and hope that kicker got a good selection of movies! So there's your 4 picks for the week. Let's see if I can get back on track! Finally today, here's everybody's favorite segment Dan's Favorite Teams Update! Wisconsin Badgers: The Badgers are 3-3 (0-3 in the Big 10). I was afraid of this. After two heartbreaking losses to open the Big 10 campaign, the Badgers took a good ol' fashioned "behind the woodshed" beating last week as they lost 48-7 to Penn State. The offense is a mess. Quarterback Allan Everidge is playing with zero confidence. And it's to the point where he's listed as "co-starter" with junior Dustin Scherer. And it wouldn't surprise me a bit if Dustin started on Saturday. And when your QB is so unreliable, it's easy for defenses to throw 8 or 9 men in the box and completely shut down your running game, which is what the entire Badger offense is predicated on in the first place. And even though they gave up 28 points, I didn't think the defense played all that poorly. They're just limited in what they can do, and when their offense does nothing, they end up in situations where they're simply over matched. Minnesota Wild: The Wild are 2-0-0 and tied with Calgary and Vancouver for first place in the Northwest division. Well the good news is that the Wild won their first two games and did so by getting offense from unexpected sources. While you expect offense from Mikko Koivu, Pierre-Marc Bouchard and Marian Gaborik, when points start coming in bunches from the likes of Andrew Brunette, Eric Belanger and Antti Miettinen, that's the start of a balanced offensive attack. And that's something the Wild have been sorely lacking in past years. The bad news comes on the injury front. Pierre-Marc Bouchard, Owen Nolan and Marek Zidlicky have all been sent home from the current road trip to have their injuries evaluated by the Wild medical staff in St. Paul. These aren't minor losses. At Nolan's age, it's no surprise that he's dinged up this early. But the Wild are counting on a solid year from Bouchard. And Zidlicky was an important free agent addition. Take those guys out of the lineup and the bench gets thin in a hurry. The one upside to these injuries is that it allows the Wild to call up the second greatest hockey-name in team history: Cal Clutterbuck. Read it out loud a couple of times. Just rolls right off the tongue! The Wild continue their road trip tonight in Miami as they take on the Panthers then they travel to Tampa to ride the Lightning. Then they get a nice 4 day break before they return home to face the Buffalo Sabres. Hopefully that break will allow them to get healthy quickly! That's it for this week folks. I'm off to Hudson, WI, to help call a high school football game tomorrow night, so most of tomorrow will be spent preparing for that. Yes, for one night only, it's the re-teaming of Dan Stevens and John Hanson for the finest in Wisconsin high school football action! Or, the best we can muster after not having done this in years! If any of you are curious, kick off is at 7pm and apparently you can "Listen Live" at SportsRadio 1400's website. I'll be back on Monday with a World Series preview and the Post-Mortem on my Week 8 picks! Until then, thanks for reading!